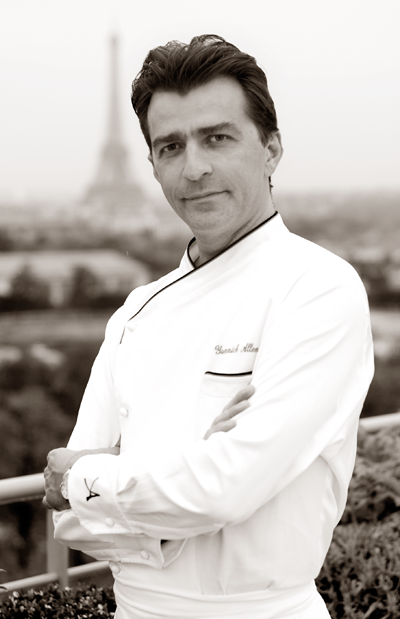 After training at the Royal Monceau and Drouant, Yannick Alléno’s skills are the result of the purest Parisian culinary tradition and he has a penchant for sophisticated cuisine with classical French roots to which he brings a zest of youth. After working at the Scribe, where he earned a second star from the Michelin Guide, he took on the management of the kitchens at the famous Hôtel Meurice in 2003 and was awarded three stars. He is also a keen competitor, since that allows him to surpass himself and set his sights even higher. Before climbing the podium at the Bocuse d’Or in 1999, he had already won 1st prize in the Paul Louis Messonnier competition, 1st prize in the Auguste Escoffier competition, and so on. Most of all however, Yannick Alléno loves his profession and has always given free rein to his imagination, creating dishes that make gourmets’ mouths water. He readily describes his cuisine as “lively and perhaps a little sensual”, and is taking it towards ever higher summits, winning a second star for the Cheval Blanc Restaurant at Courchevel. His talent, combined with his business savviness, have involved him in the development of concepts in Beirut and Beijing, to name but two. But it’s mainly in Paris, the city he loves, that he has blossomed, highlighting the Parisian terroir, the land and products of the area, first through a book, then through a bistro that finds a balance between the roots of the region and a modernity that permeates everything he does. In July 2014, Yannick took over the renowned Pavillon Ledoyen restaurant on the Champs-Elysées and immediately earned it 3 Michelin stars, thanks to his Modern Cuisine and his work on sauces and Extractions®. This new cooking trend, with its visionary and modern approach to the culinary art, combines a tried and tested savoir-faire with the benefits of the very latest technological discoveries, enhancing flavours and throwing down the bases for the evolution of French cuisine.